The first pellet I tested was the JSB Exact RS. The first three shots landed low, with one below the target paper. The group had to come up somehow. JSB Exact RS pellets hit the target low and left. One of the first three shots hit below the paper. I adjusted my sight picture to shoot the 6 shots shown above. One is in the bull — don’t miss it. This upper group measures 2.682-inches between centers. I normally use a 6 o’clock hold when shooting bullseyes. With the Webley that resulted in the three lower shots. So I used a trick from my days shooting Colt Single Action Armys. When they shot low I held the front sight higher in the rear notch and still rested the bull on top of the front post. Look at the drawing below. What I did was raise the barrel until the top of the wide bottom section of the front sight was level with the top of the rear notch. I can keep this wider base level with the top of the rear notch, but since the wider front sight base fills the rear notch completely. I can’t see anything left and right. Once the front sight is elevated in the rear notch I then put the bull on top of the front post as always. That raised the strike of the pellet by about 4 inches at 10 meters, but it didn’t do anything about left and right. I continued to shoot the rest of the pellets using this same sight picture — hoping that one or more pellets would strike more to the left. Let’s see. Before we move on, some of you are wondering why I didn’t just file the front post down to raise the strike of the round. I didn’t for one reason — I didn’t want to damage the gun. Remember I said I learned this trick while shooting Colt Single Action Armys? The real ones (not replicas made by European makers) are worth thousands of dollars, and I won’t take a file to them. So, after reading Elmer Keith, I discovered this technique that works pretty well. Next up were Sig Match Ballistic Alloy pellets. Six of them went into 1.886-inches at 10 meters. That is a lot better than the JSB’s did, though the pellets are still to the right of the bullseye. Though not small, the group of 6 Sig Match Ballistic Alloy pellets is much smaller than the group of JSB pellets fired before. Six pellets are in 1.886-inches, center-to-center. The next pellet I tried was the Falcon from Air Arms. Six of them went into 2.358-inches at 10 meters. They are still hitting to the right of the bull. Six Falcon pellets landed in a 2.358-inch group at 10 meters. This is the wadcutter pellet that you can’t buy anymore. These weigh only 7 grains, while the current H&N Finale Match Light pellets weigh 7.87 grains. So, wouldn’t you know that they would group the best of all the pellets used, up to this point! Six went into 1.407-inches at 10 meters. One pellet just clipped the edge of the target paper, so I had to measure this group differently. I measured from the far edge of the pellet hole on the left to the near edge of the hole that just clipped the paper. Then I did not subtract a pellet diameter. That gives the same results as if I had measured to the far edge of the right hole and then subtracted one pellet diameter. Six H&N Finale Match High Speed pellets made a 1.407-inch group at 10 meters. The final pellet I tested was the RWS Hobby. Six of them went into 1.407-inches at 10 meters. That’s right, this group size is identical to the group made by the Finale Match High Speed pellets. However, given the probable error in measurement, all we really know is that these two pellets are similar in accuracy. This was just a coincidence. But, since this is also the smallest group of the test, it’s nice that it was shot with a pellet that you can buy. Six RWS Hobbys went into 1.407-inches at 10 meters. I had hoped that one or more pellets would group farther to the right, but as you can see, that didn’t happen. Now I wanted to see if I could do something about that by using still a different sight picture. At first I tried holding all of the sight base all the way to the left of the rear notch. That threw the pellet about 5 inches to the left, which is way too far. Then I tried holding the base so I could see just a sliver of light on the right side of the rear notch. That got me closer to the centerline with the remaining five pellets, but the aiming wasn’t precise as before, plus it was too difficult to do consistently. Five Hobby pellets went into 1.806-inches at 10 meters. After that attempt I stopped, because this was no longer fun. The first pellet (arrow) went too far left. Then I tried a different hold that worked — sort of. Five Hobby pellets in 1.806-inches at 10 meters. Ironically, the fixed sights on my Mark VI firearm revolver are dead-on at 15 yards. I guess if I had to choose between the two I would rather have the firearm be the one that’s accurate. Unfortunately the Webley Mark VI pellet revolver that I’m testing is not that accurate. And the sights are off, as well. It would be hard to hit a soda can at 25 feet unless you learned the gun very well. The good news, though, is it shoots best with the cheapest pellets. From a realism standpoint, this one is a winner. I was very impressed by the effort that was made to copy all the details of the firearm. It’s not going to be my favorite shooter, but I will probably keep it for the realism, alone. This entry was posted in 10-meter pistol, accuracy, airgun design, CO2, firearms, lookalikes, open sights, repeater, replica airgun, technique and tagged accuracy, accuracy test, air pistols, airguns, CO2 guns, CO2 pistol, collectible guns, Collecting, firearms, H&N Finale Match Pistol pellets, JSB Match Diabolo Exact RS pellets, RWS Hobby pellets. Bookmark the permalink. Sorry the sights could not be used as intended. Maybe they could make an adjustment to the casting(s) of the front or rear sight? It would be interesting to know if this is an across the board issue with the pellet version. I shoot my rimfire rifle like that at longer distances. I raise the front post above the rear sight. And for windage I just shoot a little to the right or left as needed in other words I keep my sights lined up like just mentioned but shoot to the left or right of the target. It works real good after doing just a few shots to get the hang of it. I can shoot my rimfire rifle like that from 15 yards out to a 100 yards no problem with out ever making a adjustment. But that is of course after I done zeroed the sights for a certain distance. I definitely want adjustable sights. Then I do the holds as needed. Same as when I scope shoot. So probably not that big of a deal that this pistol your testing can’t be adjusted. But I would like it better if the sights were adjustable. And on another note. If they were adjustable I bet it would be easier to repeat sighting and possibly get a more accurate pistol. I do the same. Amazing how that trick works so well. Well, darn. I was hoping this would be a good backup when I have to fight off the feral soda cans. It is a real shame it is not very interesting. As I stated, I have the bb version and the Exhibition pellet versions .The sights on the nickel version were hard to pick up but after blackening the rib and putting red paint on the front post, I dialed into the black. The Battlefield version was a huge disappointment. Awful da pull , lousy action. I thought it might be just one bad apple but after reading this evaluation that does not appear to be the case. Returned mine for a refund. I will be surprised ifPyramid continues to offer them. A totally unacceptable revolver. I do not recommend you do such, but it would be interesting to perform dissections to see the differences. While I occasionally shoot soda cans in the backyard with my original black finish, smooth-bore Webley MK VI, a couple years ago I shot at targets in my basement at 30 meters, from a bag rest, with pellets (probably the RWS Hobby). I tried this because the internet was loaded with videos of folks shooting lead pellets out of the Webley smooth bore and getting incredible results. I found it to be remarkably accurate as well, as long as I shot slowly and with single action. It is probably one of my most accurate CO2 pistols at 30 meters. My recollection was that it almost rivaled my 8 inch S&W 586 and 8 inch Dan Wesson. And this is by a so-so at best shooter — I’m pretty shaky-handed. That’s really good to hear. Maybe this one is just not a good one? I don’t know. I’ve read that the black ones have lighter and crisper triggers than the battlefield and nickel ones, as odd as that sounds. My trigger technique is quite poor, so the trigger makes a lot of difference when I am shooting anything. Do you have any idea of the group sizes you got with pellets in the smoothbore Webley? I do not recall precisely, but I remember that I was pleased to see that it shot better with lead pellets at 30 meters than it did with BBs at a shorter distance, perhaps 20 feet. And I was simply using the shells that came with it for BBs. This was not long after the black BB model first came out, and it was the first of these. Search youtube, and you will find a couple videos of guys shooting them with pellets and getting good results. I know this is dangerous, but I have been thinking. I would like to have a CO2 pistol that utilizes a magazine system such as Sig Sauer employs, but rather than being a replica of a handgun I would want it to look something like the handguns in the modern version of Battlestar Galactica. In the lower section of the top assembly one could have a built in green laser. When the CO2 pistol is fired, instead of blow back the excess gas is diverted forward to produce a shrill whistling sound. BEWWWW! BEWWWW! It could be equipped with a molded polymer holster and spare magazine holders. A futuristic carbine could also be produced utilizing the same technology. I myself would be more inclined to play with something like this and I am sure there is a market for such with the younger or young at heart crowd. There may be licensing issues but perhaps for replicas various Sci-Fi weapons could be reproduced. I would not mind having a phaser that shot pellets or bbs. That is funny, but I do like it. Not maybe my cup of tea but neat just the same. That got me thinking, why do most phaser/laser guns in movies have a form of open sight or a peep/scope sight, but not a laser sight? I’ve always wondered about that one. But it’s the style of theater that the director feels comfortable with. If a laser sight is used, then you have to do special effects to show the laser, and that doesn’t always enhance the shot. Though in some slow dramatic scenes like in the predator series, having that triple laser pattern show up on your face makes for immediate foreshadowing! The holographic sight is exactly what I have thought about. Either that or a heads up display type of unit where you are wearing a pair of goggles or glasses and wherever the muzzle is pointed it shows a dot or other indicator. It may appear similar to a laser designator though with this type of projection you could have a large circle surrounding the indicator to help with location. With the proper exoskeleton/body armor suit it would be unnecessary to have a direct link to the weapon. The suit would be able to provide the required feedback of range, type of weapon being used, position, target location, etc. and provide the required aiming point. It would also be possible for the suit to actually reposition the weapon for the optimum shot, waiting for the command to commence firing. For that matter the weaponry could be built into the suit. In fact, if we removed the human this would provide the required space to install the AI. For now, just a video camera on the rifle, with a FPV monitor. I was just recently looking at some very awkward-looking shooting positions & wondering if a video link would be legal on the course? They exist. Compactness, robustness, power, cost, etc. are still issues, but they will eventually be ironed out. The day the President has a front row seat to a sniper shot or a fire fight is coming. Because the actors just point in the general direction during filming and the blaster beams are “painted” in later. Time does not allow for proper sighting. Besides, the bad guy always misses and the good guy always hits. We could not have the bad guy able to center his laser designator on the good guy’s chest but hit three feet to the right. If it shoots good groups, then yes! Why not? What about taking advantage of the muzzle blast in order to generate sound effects? Very good. Something else that would work for me are some of the Nerf gun designs. Using my grandson as an excuse, I have a modest collection of those also. Some look pretty cool. First I suggest trying a different pellet. I have read of much better accuracy using Meisterkuglin (spelling) pellets. Can the rear sight notch be widened rather than thinning the front? It seems to me it might be easier. If all else fails, have them send you a different revolver. Thanks, but I’m not testing for myself — though I do own this airgun. I am testing to demonstrate what a buyer can expect when ordering a particular airgun. This is how this one tested out. I have not had any luck in getting my plunger head apart on my Daisy Model H to install a new leather seal. It is now getting beat up. I have not found a parts diagram for the Model 12 or the Model H. The parts diagrams I have found for guns without the tube on the plunger head show one part number for the plunger head assembly with the seal already on it. I am beginning to think they are not made to come apart to replace the seal. Here is a link to a plunger head that may work it is a bit spendy though. The plunger heads were 23 cents back in the day lol. I will probably make a new plunger head if I can’t get a new seal on this one, or at least grind the head smooth and drill and tap it for a screw to hold the leather seal. If the seal gets the gun working then it’s worth the cost. Knowing how I am. I would go ahead and buy that seal for $31 just to have it even if I didn’t use it. And usually when I sell a gun. Those kind of extras that I accumulated for that gun I usually let go with the gun. And if you do get the seal and use it show how you did it with some pictures. And also if you do work to get a leather seal to work. And what kind of leather you use and where you got the leather from. Thanks for the link. I’m tracking some raw leather on Ebay that will make a good plunger seal, I think. Does it appear that most of the pellets struck the target sideways? If so, what might cause pellets to fly sideways, and could it be corrected? These targets are made from thin target paper that often tears like this. I don’t think the pellet hit sideways, though if they did there is no way I know of to correct it. I mentioned this a while back. Replica pistols that have barrels that are not fixed in place and actually slide back and forth will probably never be tack drivers. They must be loose to slide around. In this case, the cartridge is loose in the cylinder and may not line up all the time with the centering forcing cone and result in minor clipping. There may be slightly offset countersinking in front of each cylinder bore that lines up with the forcing cone. The forcing cone needs to be loose to slide in and out as well as the barrel. Although the cylinder and barrel cone should line up once engaged, any play in the cylinder and its lock up may introduce some slop. The holes in the receiver and outer barrel that fit the barrel and cone would also have to be precision aligned and drilled. Also I still think that a pellet transitioning from the smooth bore cartridge to a rifled barrel must push forward on that barrel somewhat as it engages the rifling and unseat the forcing cone barrel unit. May be just enough to free float the barrel and lead to irregular points of impact. What I’m getting at is there are a lot of things that may affect its accuracy and they would have to be exactly the same for each shot for any accuracy. Not too likely with all those moving parts. Sometimes you win and sometimes you don’t. May depend on the manufacturing accuracy of each part. Personally I can live with it if it’s necessary to have a functioning replica … at a reasonable price. I should have read your post before I wrote mine! Some airgun pistols, mostly semi-auto type, actually use the barrel as a hammer. The trigger pushes the barrel forward and lets the next bb in the mag pop up in place. The barrel then slips off the trigger, returns to capture the bb and continues on back to slam into the CO2 valve. The Cobray M11 and Daisy Powerline 5170, over 500FPS. operate that way. They usually have a bit more power with this set up but give up on accuracy. These revolvers don’t actually have a forcing cone at the barrel entry like a real firearm with a set gap between the cylinder These have a spring loaded barrel and a dome cone that pops back into the cylinder cone and centers it up with the barrel eliminating any air gap. The round dome cone is pushed forward by the rotating cylinder and is then spring loaded into the next cylinder bore. A lot of play with this set up. So It is a liner barrel of sorts. Could the liner be rotated as a first step? Can the muzzle end of the barrel (liner) be shimmed? And, the inside of the psuedo barrel be filed near the muzzle to get the sights and liners bore aligned? Or is there just too much slop in the system? The inner barrel is loose enough to slide back and forth but not enough to shim without possible interference. Besides it’s lubricated. Perhaps a thicker lube may remove some play. First target caption (JSBs) looks low and right! Caption says LEFT. Where is that strong and steady right to left crosswind when you need it? Alternately you could rotate the pistol 90° counterclockwise and solve both the shooting to the left and low! I would inspect the forcing cone and some pellets shot into a soft medium. I’m suspicious of the tears in the target paper since windage deviation would match the apparent yaw as long as it isn’t a full tumble. In all seriousness, does the pistol have a barrel liner? You can guess where that thought train goes! 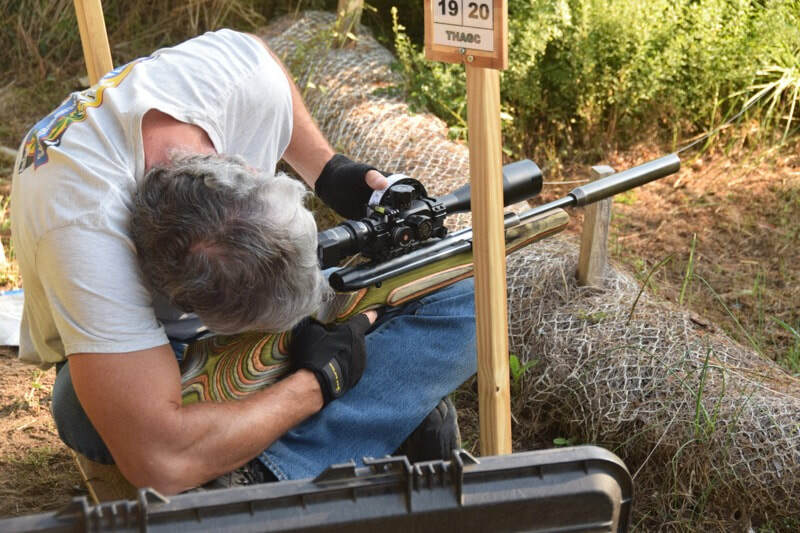 If no barrel liner…you could also try a barrel bend for both elevation and windage corrections. Don’t give up on her quite yet! Or just send it back if they are in stock for another try. Glad you firearm doesn’t have the issue. While (briefly) browsing the PA website, there is a pop up from someone asking if I would like some help. Ok. Fine. I have hit chat 2x to express my displeasure with this,…. as in before,… an X out would make this stop. Now,… it stays there, on (every) page as I am browsing. If this is something new,….. I (strongly) disapprove. I could go on and get more irate, but I will not. I do not think that long time customers of PA and experienced air gunners in general,.. appreciate a pop up staying put,.. as one is trying to browse the PA site. I just asked IT. I wouldn’t like that, either. Thanks for asking. If they want go with that concept, an “at the ready (?) icon” at the top of the page, or something. Anything but what they are doing. Go to your internet tools on your computer. You can block pop ups. It gives you options of how or if you want to receive notifications. That’s not something you should ask PA to stop doing or change how they do it. That’s on your end if you want to receive it or not. I set my laptop I used in the past to ask me if I wanted to accept a pop up from a website. All I had to do was hit accept or block. Check it out and let me know. But I think that’s where you need to go. It did just do a major update, so maybe something changed,….? My point is that it has never happened before, which made me think it is something on their end. Either way, not good. I will look into it. I just “bounced around” the PA website and it did not happen. I did look into a pop up blocker in MS, but found nothing direct. Either way, it appears to be gone,…. which suits me fine. I do not mind help, but only when I ask for it. That’s the update. Sometimes that just happens. Getting help without asking. Well at least you ain’t being bothered by that help anymore.